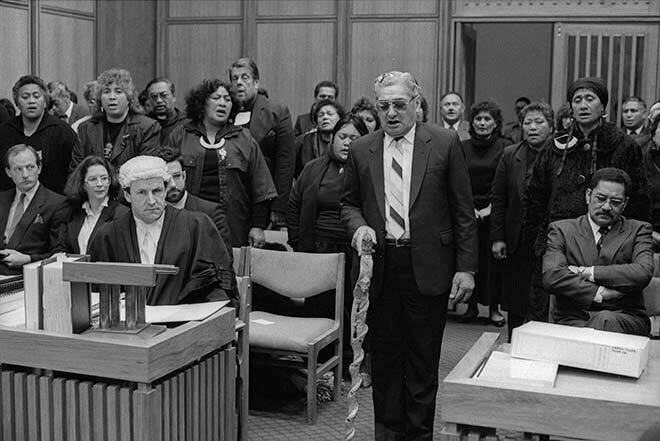 An elder of Tainui addresses the Court of Appeal in Wellington in 1989, during a case concerning the state-owned mining company Coalcorp. The government planned to sell Coalcorp, which mined coal at Huntly in Waikato. About 1,000 Tainui people travelled to the court by special train to support their tribe's opposition to the sale. The judge, Robin Cooke, found that the principles of the Treaty of Waitangi required treaty partners – the Crown and Māori – to make a genuine effort to work out an agreement. The sale of Coalcorp was stopped, and in 1995 Tainui entered direct negotiations with the government on its treaty claims, including claims to coal resources.